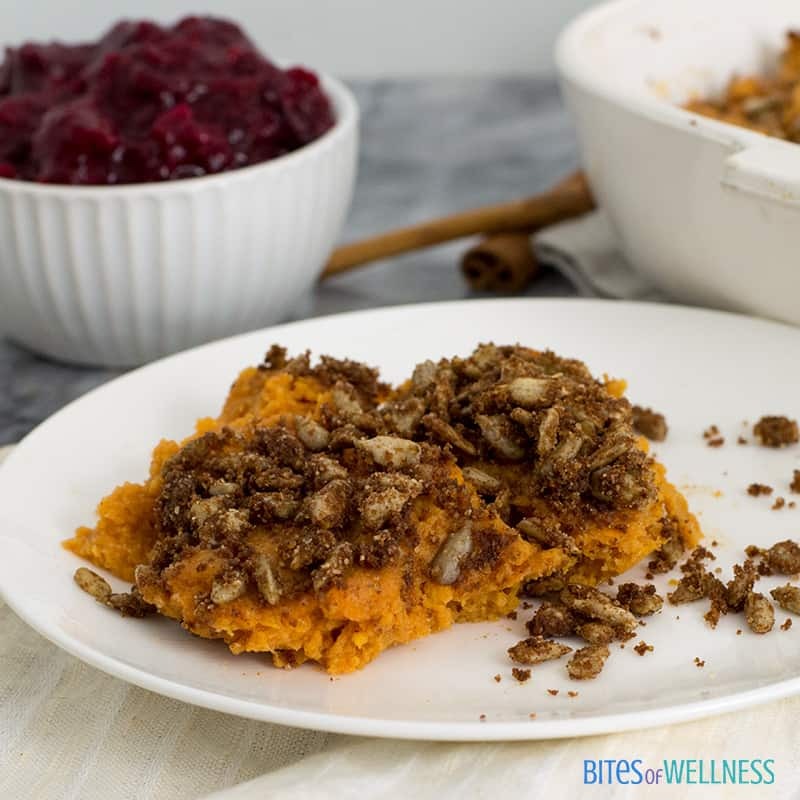 This simple healthy sweet potato casserole is going to become you new favorite go-to side dish over the holidays! Not only is it dairy free and paleo, but this recipe is ready in 30 minutes and is low fat and allergy friendly! I was so excited to start planning our Thanksgiving menu this year with my mom. The one dish I always look forward to having is sweet potato casserole. But my mom usually uses a ton of butter and sugar and it ends up being more like dessert than dinner. I made this dairy free version of sweet potato casserole this weekend so my mom could test the recipe while she was here visiting and she actually really liked the addition of the sunflower seeds (vs. pecans that are traditional). I’m so excited to know we will have so much on the table this year that is allergy friendly! The holidays can be tough for people with food allergies! We are going to be visiting family in Charlotte and Dave has a gluten and dairy sensitivity as well as a nut allergy. I don’t eat meat or turkey (but I do eat fish) so it’s pretty difficult for people to cater to us and our food allergies/intolerance’s/food preferences. Luckily I know this, and I’m not shy about asking people about what they are using in dishes, after getting sick a number of times and feeling terrible after the allergies. I try to have these conversations a few days ahead of time and I’m always ready with a recipe suggestion or two that I can either bring or offer them the recipe (if they insist on making something allergy friendly for us). 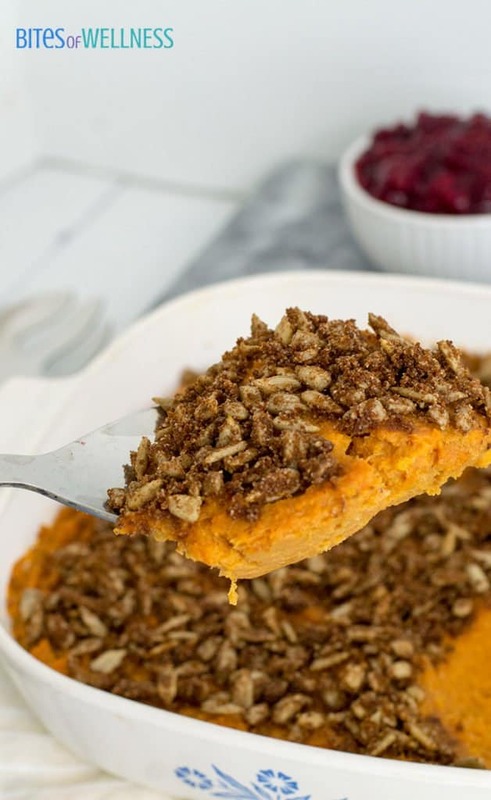 This simple healthy sweet potato casserole is one of those easy recipes, that is ready in just 30 minutes (woohoo) but it’s also insanely easy! You don’t even need a stand mixer or electric beaters. To make this recipe more allergy friendly, I used roasted sunflower seeds instead of pecan seeds and use coconut flour and coconut oil instead of all-purpose flour and butter. You are not going to miss any of these ingredients, since this recipe is so incredibly delicious! 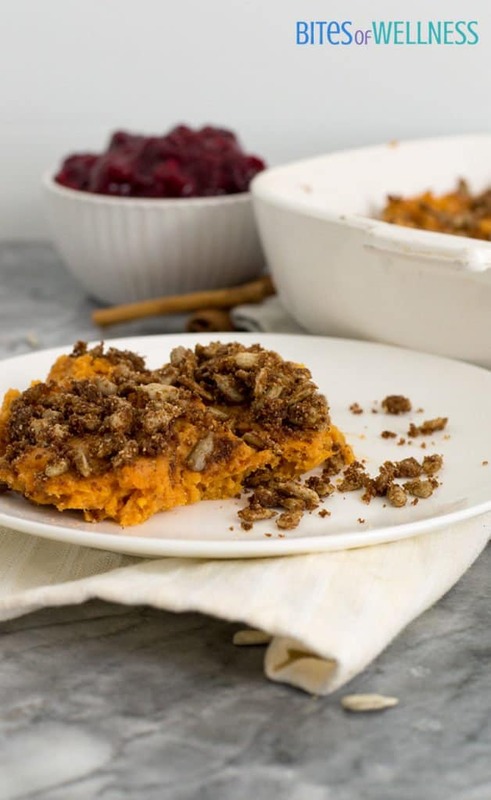 Looking for an easy turkey recipe to go with this healthy sweet potato recipe? Make sure to check out this slow cooker turkey breast. See how easy this healthy sweet potato recipe is to make with the video below! This simple healthy sweet potato casserole is dairy-free, low-fat, paleo and ready in about 30 minutes (from start to finish). Add the chopped sweet potatoes to a large pot and cover the potatoes with water. Cover the pot and cook over medium-high heat for 15 minutes. 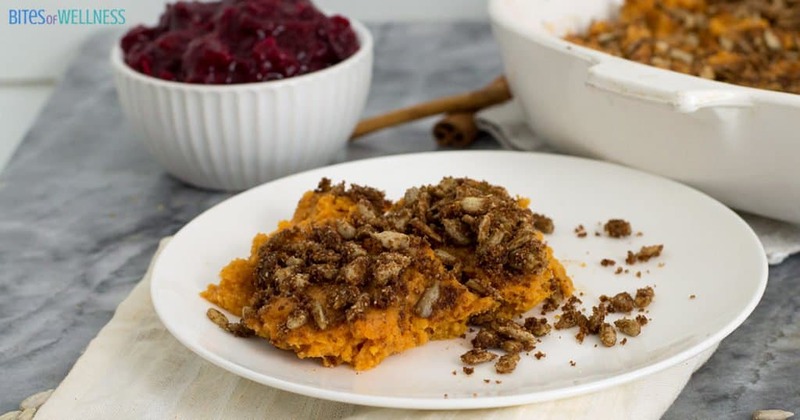 While the sweet potatoes are boiling, make the topping by combining the sunflower seeds, coconut sugar, coconut flour, coconut oil and ground cinnamon. Stir well. After the potatoes boil for 15 minutes, they should be fork tender. You can drain the potatoes in a colander. Add the potatoes back to the pot and mash with a potato masher. Thanks Roseann! We have lots of allergies in our house so always try to make things allergy friendly! See you next week. 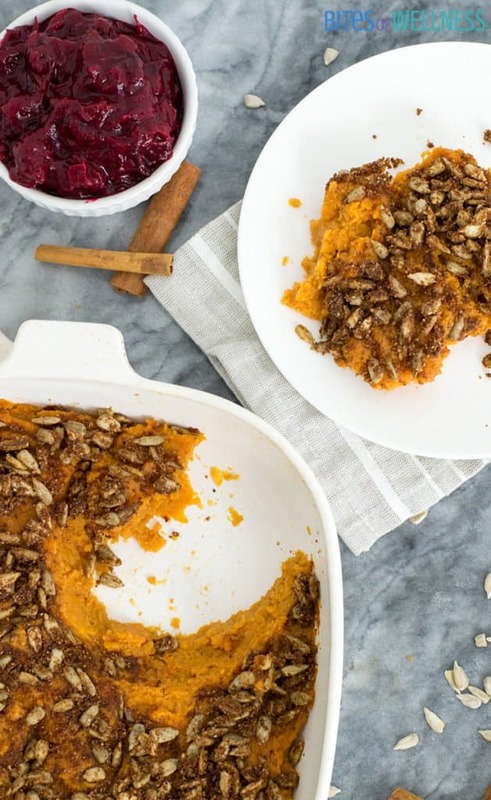 I love the topping for your awesome Sweet Potato Casserole! Thanks so much for sharing with us at Full Plate Thursday. Come to next weeks Thanksgiving party on Tuesday at 8:00 am, CST, see you then! Thanks for sharing this healthy recipe! I love the addition of sunflower seeds! SO good! 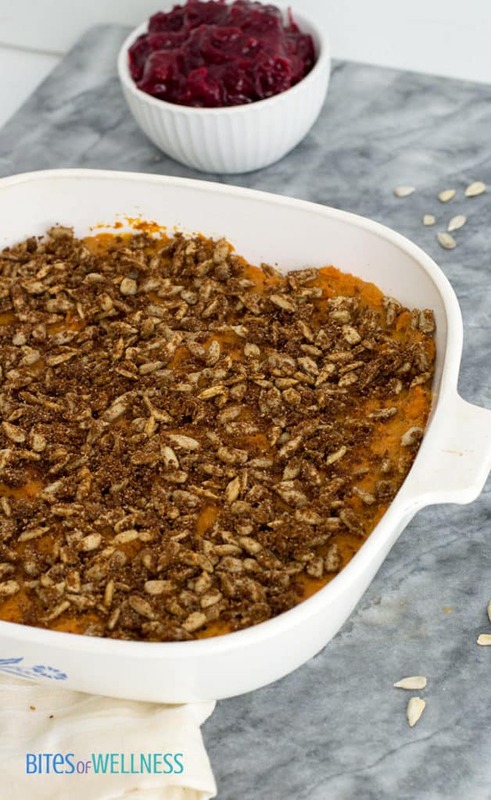 This lighter version of sweet potato casserole sounds soooo good. It’s so yummy, Marye! I can’t wait for you to try it! I think your version is more appealing than any marshmallow topped casserole! Sounds wonderful! This sounds and looks absolutely wonderful! I love sweet potatoes and they are so healthy, but too many people turn them into a calorie bomb. Just say no to the sweet potato calorie bomb! This version is the best!